"Cam" 1986 VW Transporter Doka -- SOLD!! Finally, You Can Get The Venerable VW Doka in the United States! East Coast Doka specializes in finding excellent condition Volkswagen Transporter pickup trucks and importing them from Europe. These trucks (called "Doka's" as an abbreviation of Doppelkabine in German, meaning Double Cab) are also called Crew Cabs and are very rare in the United States. We purchase many of our Dokas from the German Bundeswehr (Army) as they retire, but also purchase good condition Dokas from all over Europe. Occasionally we get Sinkas (Single Cab pickup trucks) as well. They are also known by their VW designation "Type 25". We import these vehicles into Portsmouth, NH with all necessary customs documents to register in any state, and inspect and repair any issues before offering them for sale. SOLD! This little gem just retired from the German Bundeswehr, and got off the boat late last year. We've been driving her daily since spring, and she runs great. Her 1.6 diesel engine has 100,400 miles on her, which means she's still has a couple hundred more to go. She seats 6 (3+3), or you can upgrade to vanagon bucket seats for a little more. Also has a couple of flashing lights for ambiance. Read more about this pristine VW Doka. 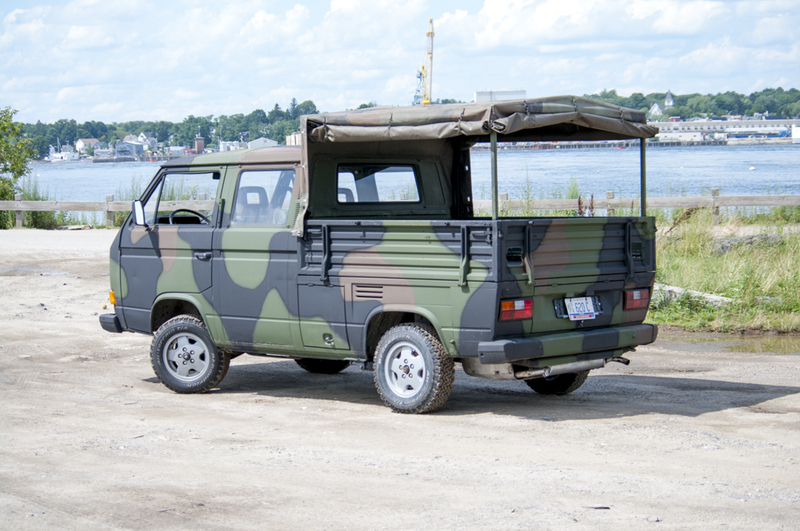 Bob from PA flew in to pick up "Olive 1," a 1985 VW Doka retired from the German Army after seeing her on tour down in New Jersey with an ECD compatriot. Drove her from Portsmouth, NH to outside Philly with perfect performance, as to be expected of a retired military lady. Check out what Bob had to say about her and some of the changes he's done since he got her.